Every year, I watch and evaluate more than 250 college players on film. The objective is straightforward: Project and transition them to the NFL. While the goal is clear-cut, the devil is in the details. I like to think (many might see me as delusional) I have a fairly well-honed sense of evaluation and projection based on my extensive film study of the NFL game during each season. Unfortunately, it’s never that simple and uncomplicated. Each year, there are players I really like on film that I believe will transition well from Saturday to Sunday’s game. And others I find intriguing even though they have limitations that are readily apparent. I am not speaking about the players likely to go in the first round. I am more interested in those players who will be seen as lower-round selections. It’s the process that makes it fascinating. It’s always easy to be an expert when you have access to the result. In three years, we’ll all know about these players. That’s no fun. There’s no debate, or differences of opinion at that point. A couple of other quick points that make the process so absorbing. One, you’re evaluating 20- and 21-year-old athletes, playing against other boys. You have to get a sense of how you feel they will play against men, and how much you feel they can develop physically once they get into an NFL weight room. Secondly, you need to have a sense when you watch a player what can be coached, and what can’t. A college player is not a finished product. 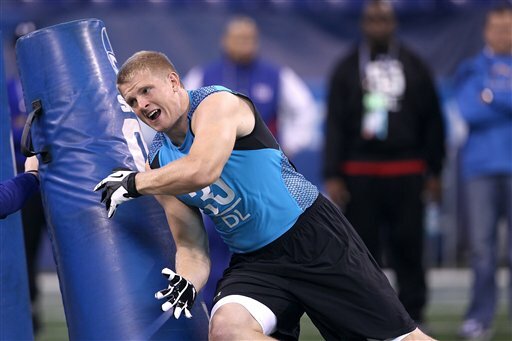 * Shea McClellin: He played both with his hand on the ground at DE, and standing up at LB in Boise State’s defense. What I liked immediately was his lateral agility and quickness. He showed the ability to get low and bend the edge as a pass rusher. He also had an instinctive feel as an inside rusher for getting skinny and getting through small cracks. He shed blocks and made plays in the run game. He was a smooth change-of-direction athlete with excellent balance and body control. My sense is he will get better in the NFL with a chance to be a dynamic edge pass rusher. He’s not as purely explosive as Clay Matthews, but I see some similarities as McClellin matures and develops. * Ben Jones: A four-year starter at center for Georgia, Jones was a very efficient player snap after snap. He played with excellent assignment discipline and execution. I loved his playing personality: He finished blocks, was competitive to the whistle, and had a bit of a nasty streak. He’s well-schooled in slide pass protection concepts, which transitions to the NFL. His limitation is his relative lack of athleticism, but that can be camouflaged based on a number of variables, including team, scheme and quarterback. * Isaiah Pead: He ran almost exclusively out of one-back shotgun sets in Cincinnati’s version of the spread. He was a decisive downhill runner with outstanding short-area burst. He went from zero to 60 in a heartbeat. Pead showed dynamic open-field instincts; he was naturally shifty and elusive with explosive change of direction. While not a big back (197 pounds), he was a tough and physical runner, just not strong and powerful. Pead was a natural catcher; he will provide alignment versatility in the passing game. I see some similarities to Jamaal Charles when he came out of the University of Texas. Charles was a third-round pick in 2008. * Miles Burris: The San Diego State linebacker was one of my favorite players to watch on tape. I loved his intense, urgent playing style. He primarily aligned outside on the right, almost always in a two-point stance, but was at times utilized as a movable chess piece all over the defense. Burris was not a quick-twitch, sudden athlete, but he played with balance, body control and play speed. He was more of a speed/power rusher than a bend-the-edge/quickness rusher. I’m struggling to transition him to a specific position in the NFL. Can he be a rush linebacker? He might be too small, and lack flexibility and burst off the edge. Is he a strong-side linebacker in a 4-3 base defense? A middle linebacker? I don’t know yet, but Burris will play in the NFL. 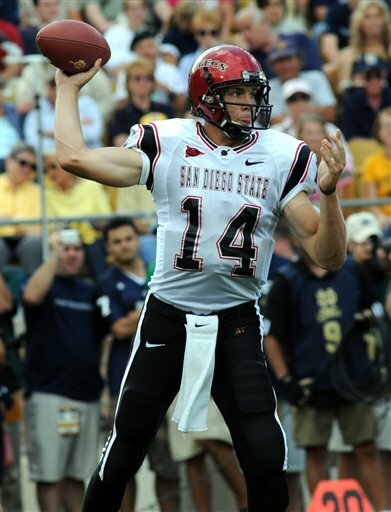 * Ryan Lindley: The San Diego State quarterback was a compelling study. He ran a pro offense, with the focus on five- and seven-step drops, and play action. No quarterback I evaluated attempted, and made, more big-time intermediate to deeper NFL-type throws. He was very decisive as a pocket passer. The ball came out without hesitation. If you spliced together his 25 best throws from the 2011 season — and did the same for all the passers in this draft — Lindley would have the biggest “wow” factor, without question. There were issues, however. The primary red flag was erratic accuracy, both imprecise ball location and wildly scattershot throws. He also was uncomfortable in the eye of the storm; when the pocket got muddied, his efficiency and accuracy were negatively impacted. I will be fascinated to see where Lindley gets drafted. I have spoken to some coaches who see a lot to work with. None of the five aforementioned players who caught my attention on film will be selected in the first round. Where they get drafted was not my point. It was the process of evaluation that piqued my interest. Let the debate and discussion begin. For more thoughts from Greg Cosell, follow him on Twitter at @gregcosell.